Together with 19 other skiers in a throng at the starting line, the silence is deafening. It’s 22 kilometres to the finish line. The starting signal rings through the air and you're right in the thick of the White Ring. The White Ring in Lech Zürs has international cult status. Ambitious skiers compete in the popular ski race, which captivates spectators along the course and at the finish line. The race demands endurance and technical perfection, while the racers zip downhill across the various sections. All information about the registration and further details will be published here as soon as possible. WHAT A RACE 2019! 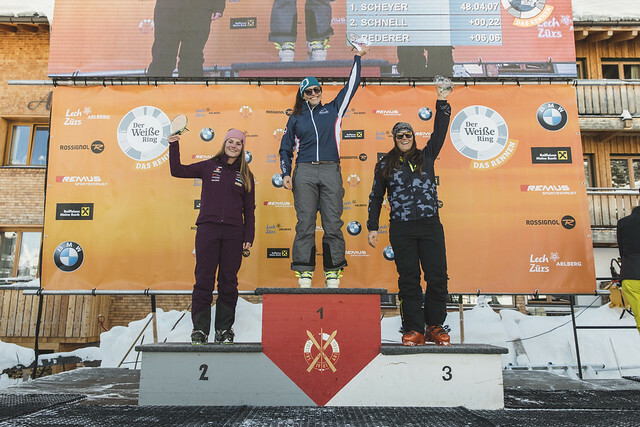 AT BEST CONDITIONS AND DREAMY WEATHER THE WHITE RING – THE 2019 RACE WAS FOR ALL ATHLETES AND ATHLETES A UNIQUE EXPERIENCE. THE ORGANISATION TEAM WOULD LIKE TO THANK ALL PARTICIPANTS FOR A GREAT RACE! SEE YOU AT THE WHITE RING – THE TRAILCHALLENGE AND AT THE WHITE RING – THE RACE 2020! Der Weisse Ring 2019 from NEP Switzerland AG on Vimeo. The circuit comprises 5 downhill runs, 5 ropeways, an intensive ascent and a challenging backcountry ski run. The race starts on the Rüfikopf mountain. Every 100 seconds a group of 20 people dash around the Omeshorn mountain to Zug via the Schüttbodenlift, Trittalpbahn and Madloch ski runs. From there the chairlift takes racers up to the Balmengrat, from where the last section leads down to Lech. To thunderous applause, the 1000 participants are lauded at the grand finish line. The White Ring – The race! Such a unique and big event is only possible with the help of strong partners! These organisations are supporting us with enthusiasm and passion! In January, competitive skiers dream of winning “The White Ring Race” while spectators soak in the unique atmosphere. Watching the finish line and celebrating at the after party is a unique experience on the Arlberg. During The White Ring Night, DJs and live music make Lech Zürs pulsate and the stars of the winter sports scene party together. In the past, Josef Strobl, Harti Weirather, Tom Stiansen and Patrick Ortlieb have already taken part in the legendary ski race. Even Andreas Goldberger and David Coulthard have experienced the Arlberg from its wild side on skis. Every year, 1000 participants take part in the race around the White Ring with locals and guests answering the call from Lech Zürs in hopes of standing on the podium in different age group categories. As in other sports, the open classification receives the most attention. Riccardo Rädler proved himself more than capable in winning the last three races. Meanwhile, Alexandra Scheyer has been the reigning champion in the women’s singles since 2017. The team classification is dedicated to the founding father of the White Ring, Sepp Bildstein, whose dream was to install a lift at the Arlberg for skiing. It was his vision that planned this winter sports activity and under his leadership 15 ropeways were installed in Lech Zürs. So in his honour, the Bildstein Trophy is now the prize for the team that completes the 22 km course the fastest. Riccardo Rädler, as part of “Klimmer Wohnbau Racing” with Pepi Strobl, Mathias Gorbach and Paulina Wirth, won the team ranking in the 2017 race. Due to poor weather conditions the race had to be cancelled in 2018. The White Ring - The race is supported by probably the most sporty companies! Because it's even more fun together. These companies have secured themselves a fixed starting place in the team.